I’ve always taken Handsfree Phone calls for granted, one of my earliest jobs was fitting Mobile Phone handsfree kits into cars. Back then Bluetooth was a weird and mysterious technology that few people understood and fewer people knew how to install. Of course my company car had a handsfree kit so actually holding a phone to my head seems weird these days.Blast forward a few years and as part of looking after call centres and installing PBX’es I’ve once again been the goto expert on headsets for user’s deskphones and selecting where DECT and Bluetooth were appropriate.These days, however with Skype for Business (formally Lync) enabling so much collaboration and with modern business’s tendencies to decentralise or meet up in coffee shops. It becomes more and more important for Lync users to stage a meeting whilst mobile.I too use my own Lync infrastructure to host a meeting, sometimes at a prospective client or whilst training and I don’t need to spend time faffing about with whatever solution is onsite.Step in the dedicated Lync speakerphone.Now first off, some transparency.I have not paid for any of these units, they have been given to me as part of a promo or gift from the vendor, none of them gave the units knowing I was going to review them so there is no bias towards one vendor or another.If you’re just after my recommendations, jump to the break and check out the summary. I was given this unit as a prize at TechEd Melbourne 2014 and my first impressions were good. I had the device up and running within minutes on both my mobile and my PC thanks to the USB dongle, all whilst enjoying after conference drinks. The unit has quite a HiFi appliance look to it, very corporate and definitely not something that you would be afraid whipping out in front of a client during a meeting to start a conference with.The buttons are all nice and large and indicate very easily what they do, the LED’s behind them are context aware and light up relevant buttons accordingly, for example the Phone Icon lights up Green to answer a call and Red to hangup. One thing missing that I have seen in other Plantronics devices is Voice Guidance, typically headsets such as the Legend UC can be configured to provide voice feedback on connections and pairing.Interestingly the dongle used by the Calisto is the same as the dongle used on the Plantronics Legend UC, however the dongle can only be paired to one device at a time, so don’t go thinking you can have your headset and your speakerphone on the same dongle. This also confuses the device selection in Lync so I wouldn’t recommend it. 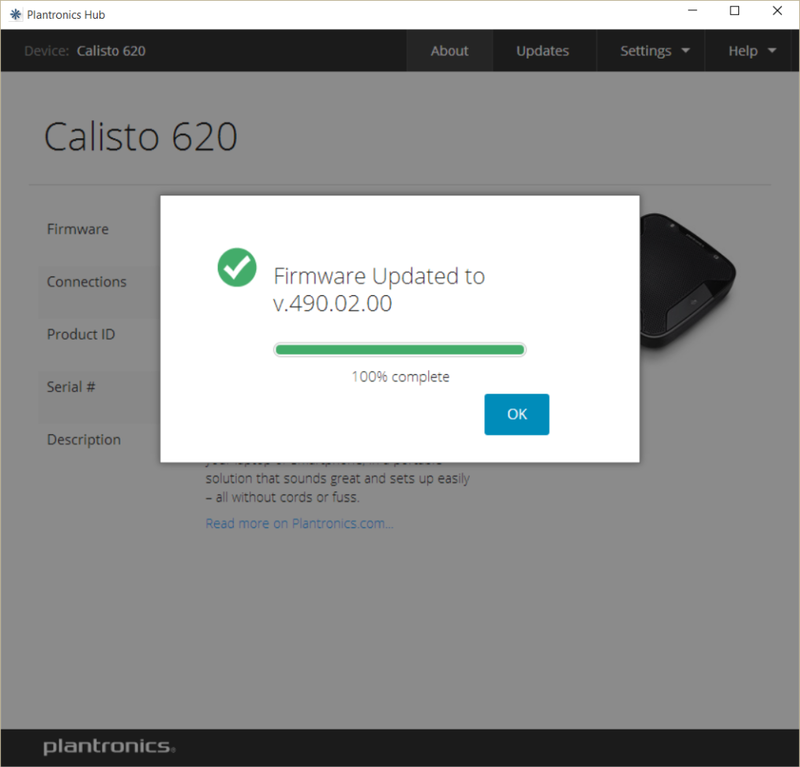 If you want both devices, either use both dongles or switch dongles if your tight on USB ports, The Calisto has a nice dongle storage silo so this shouldn’t be a problem. Whilst doing the research for this I noticed that the battery is a user replaceable part. Not a bad idea if you have a massive fleet of them, otherwise I suspect when/if the battery does go most users would simply ask for a new unit. 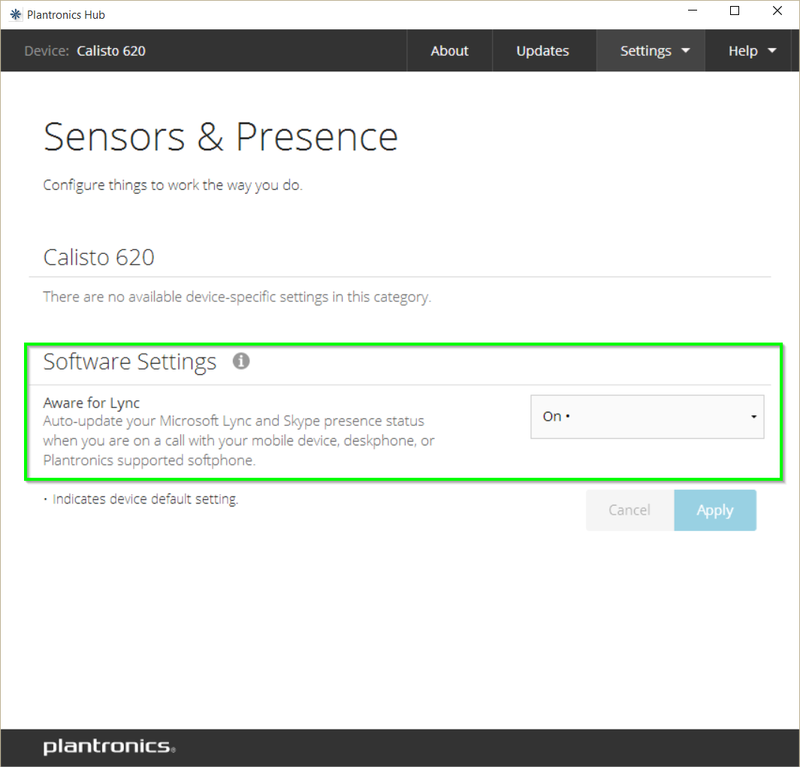 One of the best features of Plantronics Hub is that it understands when my device (headset or speaker) is in use, so for example when I take a call on my mobile using either the headset or the speaker, my Lync status (and thus my Status LED) is automatically updated to say I’m in a call. This also applies for a meeting room install if someone uses it with their mobile device. No Audio output for meeting room installs. Another free gift as part of a conference, this time at the Melbourne Lync users group, Once again I had the device up and running fairly quickly over drinks afterwards. (I don’t actually drink at these things, lame I know) I even had the device passing audio through to my car via the 3.5mm socket before I even left the car park. 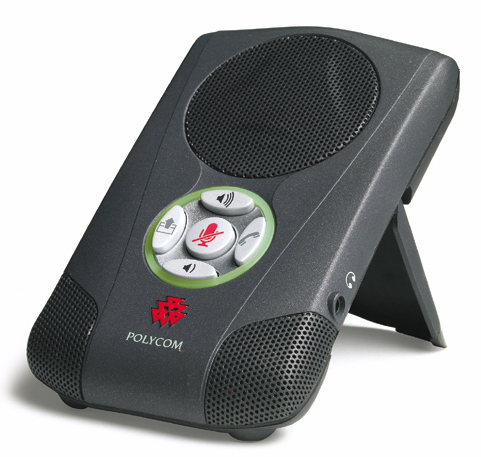 The Speak’s design takes the more Apple approach, everything on the device uses capacitive touch buttons, with context sensitive LEDs very clearly indicating status. If you mute the microphone all the LED’s around the devices outer rim turn red, adjust the volume and you’re given a volume graph, and just because it’s cool Jabra make all the LED’s glow purple when the device is (trying) to update its firmware. Sometimes on my unit here the device would get stuck in some sort of connection loop repeating “Connecting to mobile device, Disconnected” a few times then function as expected, I’m not entirely sure what was going on here, but I assume a firmware update will resolve the issue. It worked just fine for all other intents and purposes. 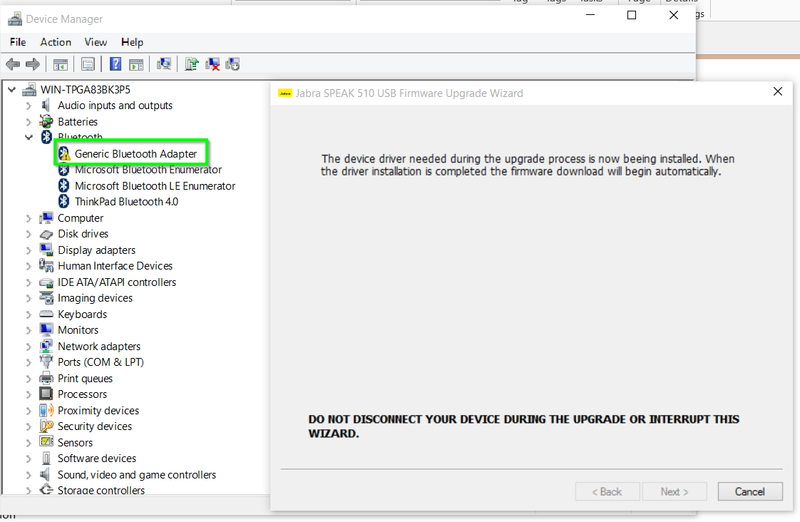 Speaking of firmware updates, I could not get the Jabra device to update on either my Windows 10 or Windows 8 machines, The wizard simply hangs after putting the device into DFU mode as the drivers are unsigned. Whats all the fuss about dongles anyway? So what’s the device I carry with me Day to Day? 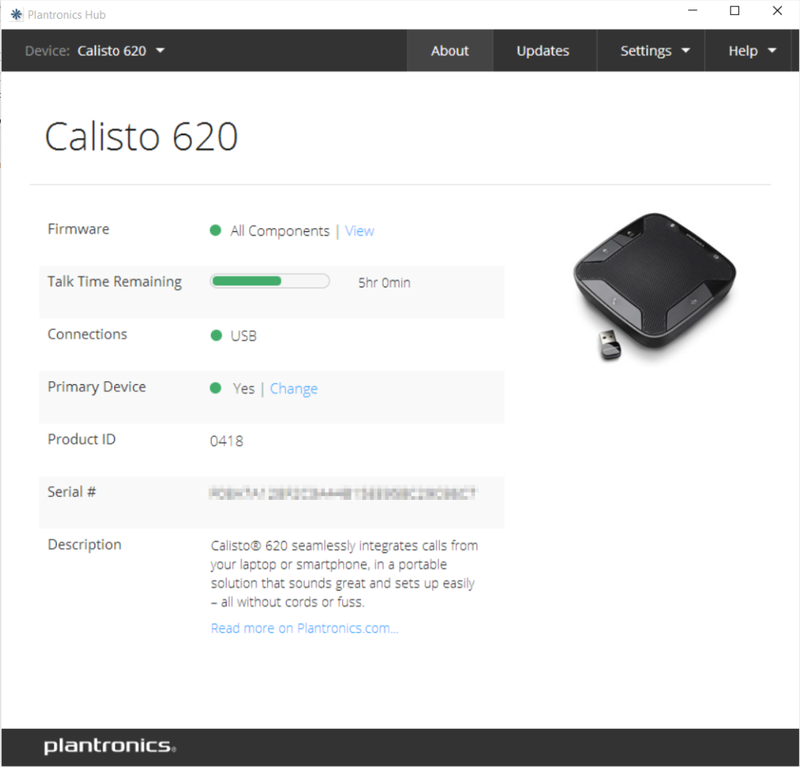 It is still my Plantronics Calisto, it looks good in meetings, it has awesome voice quality especially with background noise and multiple users in a room. I use it as a loudspeaker for presentations, keeping the kids entertained and most importantly for me, I won’t lose the dongle as its stored neatly in the silo. 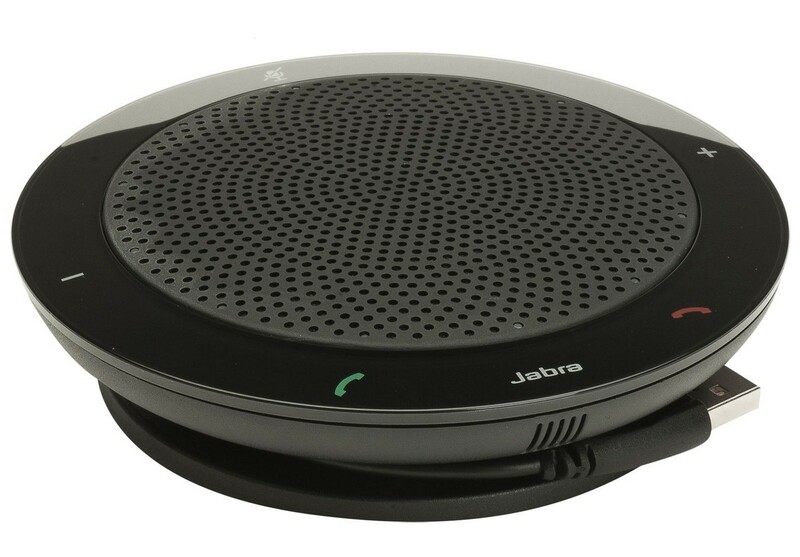 The Jabra Speak lives in my car, connected to the stereo as a poor man’s Bluetooth head unit for music, or attached to a pair of speakers when I need to be able to output to a hifi or similar. As for the CX100, for the same price you can choose from either of the two cordless units above. Both come with nice travel cases, the required dongles, charging cables and sound better thanks to their high density foam bases. 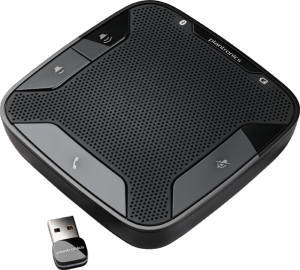 It’s a shame really as Polycom looked to be on a winner with the CX100’s replacement, the Sound Station Connect. But unfortunately they decided not to put the device into production. More info on that over here. https://greiginsydney.com/polycom-soundstation-connect/ Anyway, I hope this has been informative, it’s my first review of hopefully more Lync related things to come. Do you have any questions or feedback for perhaps the next review? Is there a particular product you want me to look at? Leave them below! 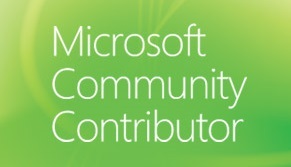 Had you able to get work the CX100 on Windows 10 and Skype for Business? 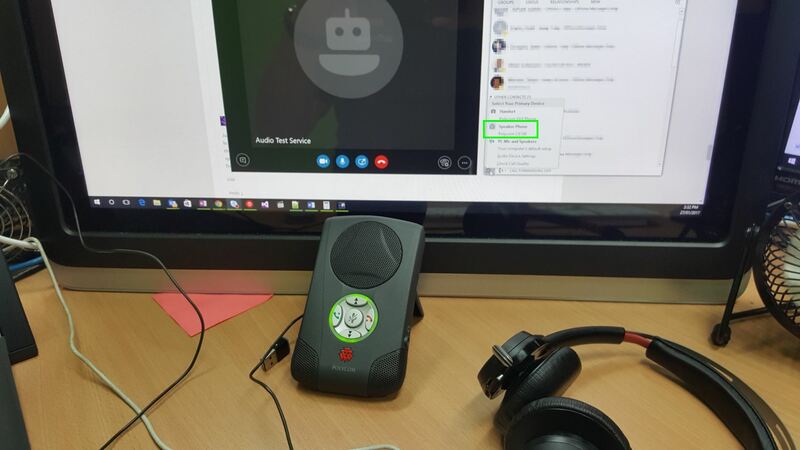 Hi Philippe, the CX100 is a Qualified Skype4B device and should work in your Skype4B deployment. Infact I have an old OCS2007 certified one and it works on my Surface with Windows 10 Version 1607 just fine. It works, but connected on a Super Speed (SS) USB port on laptops!